Hunter Hopp buys a dog from a vagrant. It takes a while for the dog – now called Krambambuli – to get used to his new owner, but he does become a loyal companion. A loyalty that does get tested. Poor Krambambuli really has been dealt the worst cards and the story makes you feel that a lot. Ebner-Eschenbach’s clear prose and sharp observations are certainly made to show its harsh fate. My heart was broken. There were tears. I haven’t yet dared to watch the film(s) based on the story. Provi was left behind in a village when he was only a little child. Having no place in the village and being treated cruelly make him hard and cruel as well. But there may be hope for him yet. Life doesn’t really get better for dogs in this story, either, so here’s another story to break my heart. But in the end, I did appreciate the morale of this story that ultimately Provi showing vulnerability and love is the more transformative experience for him than receiving it. Although of course, giving and receiving are inextricably linked. A count tells the story of a former servant to a countess. The servant – Mischka – caught the eye of the count’s grandmother and she started to make decisions for him, decisions supposed to make his life better. In this story, there are no dogs. Instead there are people with power and people without power and Ebner-Eschenbach delivers a damning story against people (in this case nobles) having power over other people. To deliver that statement, the poor people have to suffer, but in this case, I cried less and got more angry. But still. There were tears. Summarizing: So many tears, but in a very good way. 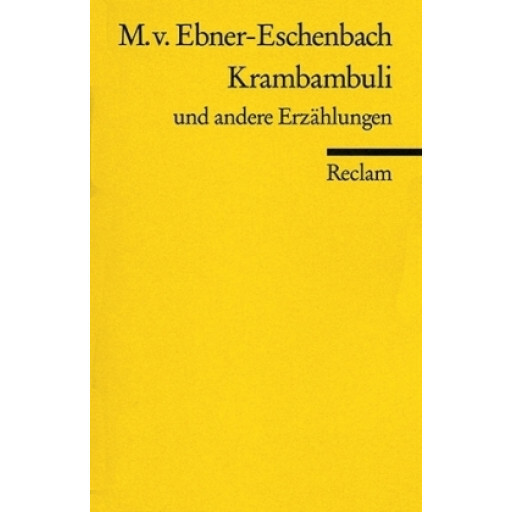 This entry was posted in austrian writer, books, female writer and tagged Krambambuli and Other Stories, Krambambuli und andere Erzählungen, Marie von Ebner-Eschenbach by kalafudra. Bookmark the permalink.